Members of LULAC Councils from around the U.S. came out publicly to stand against their National President Rocha Jr. who send a letter praising and in support Trump’s facist immigration reform plan. LULAC Councils also called for Rocha to retract letter. An online petition calling for Rocha to immediately resign was initiated by LULAC members. Trump’s latest immigration reform was condemned by The National Hispanic Leadership Agenda, a coalition of 45 of the nation’s most preeminent Latino advocacy organizations, which is offended by and condemns the immigration framework released by the White House. Trump’s announcement in September to end Obama’s DACA program on March 5, 2018 caused the dilemma today of trying to find a solution for 800,000 DREAMers. Since September, at least 16,000 DREAMers have lost their legal status due to Trump’s decision to end DACA. We do not agree with the position taken by the National LULAC President. The LULAC National Executive Committee approved the following statement on Wednesday to oppose their LULAC National President Rocha’s recent letter to Trump in support of his immigration reform plan. The organization’s official position on the DREAM Act is that “LULAC is adamantly opposed to President Trump’s recently released immigration framework which calls for $25 billion in US taxpayers’ money for an ineffectual wall between the US and Mexico, increased detention of immigrants, elimination of 5 out of the 7 categories of family-based immigration visas, and elimination of the diversity lottery visa program for underrepresented countries, among other draconian anti-immigrant policies. Brent A. Wilkes, the Chief Executive Officer of LULAC who has worked for 30 years with the organization released the following statement, “…I am deeply saddened and shocked by the letter sent by our organization’s President, Roger Rocha, to President Trump on January 28. In that letter, Mr. Rocha, on LULAC letterhead and without consulting our staff nor board, endorsed the four pillars of President Trump’s immigration reform framework, in a clear contradiction to the policies voted on by our members at our 2017 National Convention. El miércoles, miembros de la Liga de Ciudadanos Latinoamericanos Unidos (LULAC) salieron públicamente a denunciar, condenar y solicitar la renuncia de su presidente nacional de LULAC, Roger C. Rocha Jr., por enviar una carta al presidente Trump en apoyo de su último plan de reforma migratoria. Rocha escribió que Trump está “estableciendo un marco razonable sobre la reforma migratoria y la seguridad fronteriza”. Una petición en línea que solicita la renuncia inmediata de Rocha fue iniciada por los miembros de LULAC. La última reforma migratoria de Trump fue condenada por The National Hispanic Leadership Agenda, una coalición de 45 de las organizaciones de defensa de los derechos humanos más prominentes de la nación, que se ofende y condena el marco de inmigración lanzado por la Casa Blanca. La decisión de Trump de terminar con la DACA de Obama el 8 de marzo del 2018 provocó el dilema de tratar de encontrar una solución para 800,000 DREAMers. Desde septiembre, al menos 16,000 DREAMers han perdido su estado legal debido a la decisión de Trump de terminar con DACA. “Después de revisar la carta publicada en numerosos sitios de noticias que presuntamente fue enviada por el presidente nacional de LULAC, Roger Rocha, al presidente estadounidense Donald Trump, podemos confirmar su autenticidad y afirmar claramente que el puesto al que se hace referencia nunca fue visto ni aprobado por la Junta Nacional de LULAC o Comité Ejecutivo. Esperamos trabajar, como una organización unida con un claro propósito y dirección, con el liderazgo del Congreso en la elaboración de una solución bipartidista que protegerá a nuestros DREAMers y destinatarios de DACA, y pone a nuestra nación en el camino para arreglar nuestro sistema de inmigración roto “. El Comité Ejecutivo Nacional de LULAC aprobó la siguiente declaración el miércoles para oponerse a la reciente carta a Trump del presidente nacional de LULAC, Rocha, en apoyo de su plan de reforma migratoria. La posición oficial de la organización en el DREAM Act es que “LULAC se opone rotundamente al marco de inmigración recientemente publicado del presidente Trump que exige $ 25 mil millones en dinero de los contribuyentes estadounidenses para un muro ineficaz entre EE. UU. Y México, aumento de la detención de inmigrantes, eliminación de 5 de las 7 categorías de visas de inmigración basadas en la familia, y la eliminación del programa de visas de lotería de diversidad para países subrepresentados, entre otras políticas draconianas antiinmigrantes. “Además, compartimos la opinión de nuestros miembros, socios de la coalición y aliados de que el lenguaje hiriente, inexacto e inflamatorio del presidente Trump hacia los inmigrantes y las comunidades de color no promueve los intereses del país ni representa los valores de esta nación”. Brent A. Wilkes, el Director Ejecutivo de LULAC que ha trabajado durante 30 años con la organización, dio a conocer la siguiente declaración: “… Estoy profundamente triste y conmocionado por la carta enviada por el Presidente de nuestra organización, Roger Rocha, al Presidente Trump el 28 de enero. En esa carta, el Sr. Rocha, con membrete de LULAC y sin consultar a nuestro personal ni a la junta, respaldó los cuatro pilares del marco de reforma migratoria del presidente Trump, en clara contradicción con las políticas votadas por nuestros miembros en nuestra Convención. “Mi nombre es el segundo nombre que aparece en el membrete, debajo del del Sr. Rocha. Por esa razón, quiero declarar inequívocamente que rechazo el respaldo del Sr. Rocha a la postura del Presidente sobre la inmigración y puedo afirmar con autoridad que su carta no representa mi punto de vista personal, ni el de muchas de las docenas de personas con quienes he hablado … En cuanto a la declaración del Sr. Rocha de que “Nosotros en LULAC continuaremos haciendo nuestra parte para hacer realidad su visión”, quiero ser muy claro: el “nosotros” al que se refirió el señor Rocha no me incluye a mí personalmente, ni en mi rol como CEO de LULAC “. 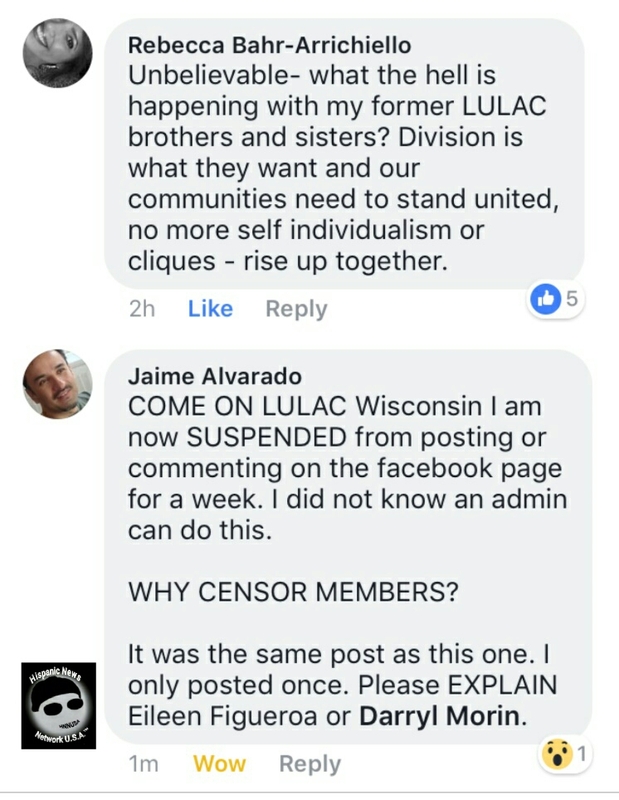 In other LULAC news, Jaime Alvarado who was an administrator for the LULAC Wisconsin Facebook page was abruptly taken off and his post on National LULAC President Roger C. Rocha Jr.’s letter to Trump was also deleted. Alvarado is now demanding answers why he was censored or suspended for a week from administrators who he named as Eileen Figueroa de Lopez and Darryl Morin. Editors note: Disgraced LULAC National President Roger C. Rocha Jr. explains his letter of support to Trump and recent immigration reform plan. Rocha says that it was a personal letter to Trump and that he won’t resign and possibly LULAC members calling for his resignation will “step back” and get over it. Smh, Rocha shouldn’t have send a personal letter with the LULAC National letter head and made reference that “we” the organization was supporting Trump’s immigration plan. Cuevas Quiles lll will serve 4-years in prison and 8-years supervision for four child support non-payment felony convictions. 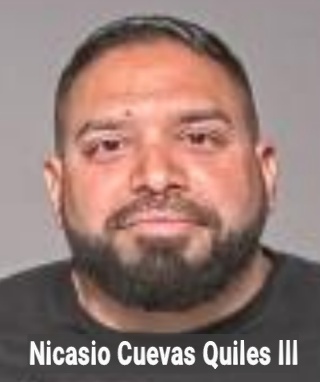 Milwaukee, Wisconsin – On Monday, Nicasio Cuevas Quiles lll, 44, aka, “Nic Jones, Nic Yoda, Quil de Nic” was sentenced to 12-years in prison for four felony counts of failure to support child convictions. Cuevas Quiles pleaded guilty on all four felony counts on October 10, 2017 in a plea agreement that allowed for three other felony counts for failure to support child be dismissed. He filed a post-conviction relief with the Milwaukee County court. Cuevas Quiles will be incarcerated for 4-years and will be under supervision for 8-years. He will also have to pay $144,043.93 in child support, according to Milwaukee County Court records. Cuevas Quiles was taken into custody on Monday and booked at the Milwaukee County jail until he is transferred to a Wisconsin Department of Corrections Institution (prison) to begin serving his sentence. Cuevas Quiles has a misdemeanor and felony charges pending and is scheduled for a court status conference hearing on March 6, to face pre-trial on April 16 for one misdemeanor count for theft of $2,500 and one felony count for issuing worthless checks of $2,500. Cuevas Quiles established the Latin American Motorcycle Association Nomads (LAMA-Nomads) in Florida and attempted to trademark (TM) the Latin American Motorcycle Association (LAMA) named without authorization after the original LAMA motorcycle group based in Chicago, Illinois created 41 years ago by Mario Nieves failed to renew its trademark name with the U.S. Patent and Trademark Office (USPTO). Cuevas Quiles was a fomer member of LAMA, but left the group and tried to take its name after the original LAMA group rejected Cuevas Quiles proposal to video document the LAMA 40th Anniversary Celebration, according to former associates involved in the video project. He boasted to original LAMA groups in Florida that he owned the trademark, but when Hispanic News Network U.S.A. (HNNUSA) investigated, he did not owned the LAMA named as he claimed and his lawyer from Minnesota who filed the trademark application removed himself for lack of contact with Cuevas Quiles and the trademark filing was placed on hold and no action taken. Since the trademark incident, the original LAMA group in Chicago refiled for the trademark. HNNUSA has attempted multiple times to contact Marcos Rodriguez, the President and David Soto, the Vice-President of LAMA National from Chicago, but no response has been received concerning the association’s name infringement by Cuevas Quiles and his LAMA-Nomads members. In brief: Cuevas Quiles TM registered Latin American Motorcycle Association L.A.M.A. on June 20, 2017 and then the name was TM registered by LAMA Corporation from Chicago on August 9, 2017. The TM for LAMA Corp. had expired on August 9, 2013, then LAMA was reactivated in July 28, 2015 and expired on March 13, 2017. Cuevas Quiles didn’t include Nomads in the TM filing, according to the USPTO. The USPTO has posted on TSDR check that on December 12, 2017, Attorney Eduardo E. Drake from Fantastic IP Consulting, LLC, Minneapolis, Minnesota who was representing Cuevas Quiles in the TM filing had withdrawn from the filing due to lack of communication with client (U.S. Serial # 87498322) for request to Trademark “Latin American Motorcycle Association LAMA”. Quiles filing on June 20, 2017 is still active, but remains under examination with a “non-final Office action” by USPTO. Which actually means that Cuevas Quiles doesn’t have the exclusive for the LAMA Trademark yet, which he has implied to have, according to the USPTO records filing. Cuevas Quiles hasn’t TM registered the LAMA-Nomads in the State of Florida yet, according to Corporation state records.HNNUSA noticed that Cuevas Quiles has disabled his Quil de Nic Facebook account, but the Latin America Motorcycle Association Nomads Facebook page and the LAMA-Nomads internet dot com remained active. On August 8, 2016, a Milwaukee County court judgement of $340,838.00 was granted for Urban Skyline Investment Company LLC against Riverwest Holdings LLC, which Cuevas Quiles operated. In September of 2015, a Milwaukee County court judgement of $25,668.25 was granted to ATID Investment LLP against Cuevas Quiles lll and Mind Mill Creative LLC, according to Milwaukee County Court records. In July 2015, a Milwaukee County court judgement of $11,192.03 was granted for the City of Milwaukee against Cuevas Quiles. Other judgements in Milwaukee County showed that in at least 18 cases resulted in a combined total of $39,898.47 against Cuevas Quiles, according to court records. On September 12, 2016, Cuevas Quiles filed for Chapter 13 bankruptcy in U.S. Bankruptcy Court for the Eastern District of Wisconsin. Coreas was taken into custody by ICE after Gonzalez turned him into immigration officials for being undocumented. Coreas in December had filed a civil lawsuit against Gonzalez in a Cook County Court for wages owed. Chicago, Illinois – Elvin Alexander Coreas is facing deportation to El Salvador, according to the U.S. Immigration and Customs Enforcement (ICE). Coreas was taken into custody on January 24, 2018 in Chicago by ICE agents after his former boss, Jorge Vidal Gonzalez allegedly called ICE to report him as an undocumented worker. 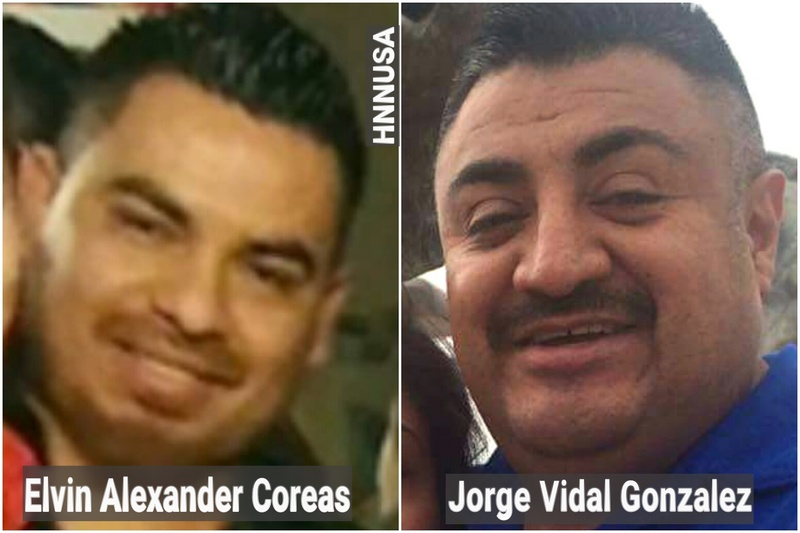 Gonzalez from Riverside, Illinois had hired Coreas for a job and he failed to pay $950 in wages and stole half of Coreas work tools, according to a Facebook video posted on the social network by Father José Sigifredo Landaverde. Coreas is currently held at the Kenosha County Jail in Wisconsin, which has a $6M contract with ICE to hold undocumented detainees being processed for immigration court hearings and facing deportation. Coreas had filed a civil lawsuit on December 27, 2017 (Case #2017-M1-040677) against Gonzalez in a Cook County Court First Municipal District for wages not paid, but Gonzalez had called Coreas demanding him to redraw the lawsuit. Gonzalez had threatened Coreas that he would call ICE on him, if he failed to drop the lawsuit, according to Coreas wife, Karla Patricia Sánchez. Father Landaverde confirmed that a rally will be held on Monday, January 29, 2018 at 11:00 a.m. in front of the ICE Field Office located at 101 W. Congress Parkway in Chicago. Father Landaverde is also calling for law enforcement authorities to investigate Gonzalez for stealing Coreas work tools and not paying him wages for work done. 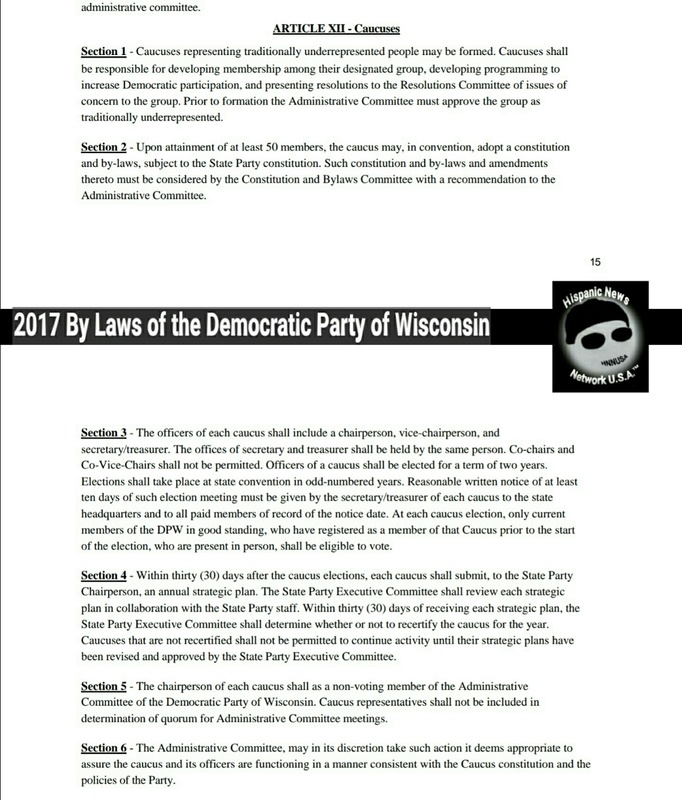 The amended June 2017 Constitution for the Democratic Party of Wisconsin eliminated any chance for the Latino Caucus and other minority caucuses from having a voting representative in the state Governing Administrative Committee. Milwaukee, Wisconsin – Hispanic News Network U.S.A. (HNNUSA) has learned that the Democratic Party of Wisconsin (DPW) under their amended June 2, 2017 Constitution assured that minority caucuses, which includes the Latino Caucus, American Indian Caucus, Black Caucus, Labor Caucus, LGBT Caucus, Rural Caucus, Veterans Caucus and the Women’s Caucus be prohibited from having a member of each Caucus as a voting representative in the Governing Administrative Committee today. According to the 2017 amended DPW Constitution, the Administrative Committee would “examine various entities to determine whether such enties qualify as a caucus.” A caucus actually represents underrepresented people, according to the DPW, but in this case, minorities are very underrepresented in the Administrative Committee at the state level within the party itself. In the 2014 DPW Constitution, the College Democrats of Wisconsin were considered the Youth Caucus and had a voting representative in the Administrative Committee, but no other caucus that included minorities were allowed to have a voting representative in the Administrative Committee. In other words, the DPW implemented and followed a Constitutional policy that prevented minority caucuses from having a voting member in the Administrative Committee. To further the discriminatory practice within the DPW, the College Democrats were stripped from being recognized as a caucus and are now recognized as official arms of the DPW including the Young Democrats of Wisconsin. In the 2017 By Laws of the DPW Article Xll Caucuses, Section 5, says that a chairperson of each caucus shall be a non-voting member of the Administrative Committee. The DPW should be a party of inclusion instead a party of exclusion. School officials at the Franklin High School have identified a student who was responsible for placing labels of White and Colored on water drinking fountains to show unofficial segregated use. 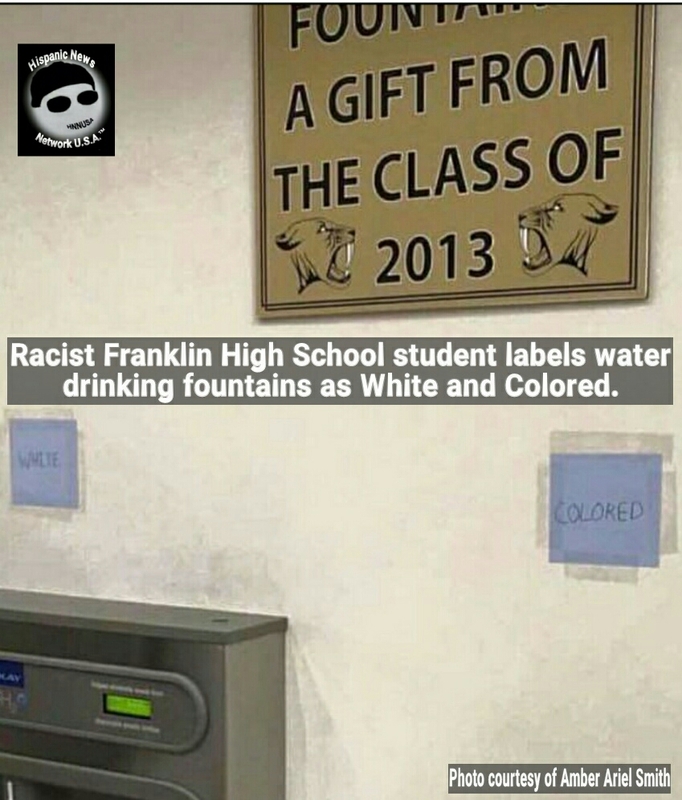 Hispanic News News Network U.S.A.
Franklin, WI – On Tuesday, Franklin High School (FHS) administrators confirmed that a student has been identified and is facing discipline for placing segregated water cooler labels that read White and Colored. A photo of the labels above water drinking fountains was posted in Facebook (FB) by Amber Ariel Smith and circulated quickly and drew condemnation by local groups and parents of diverse students attending the school. 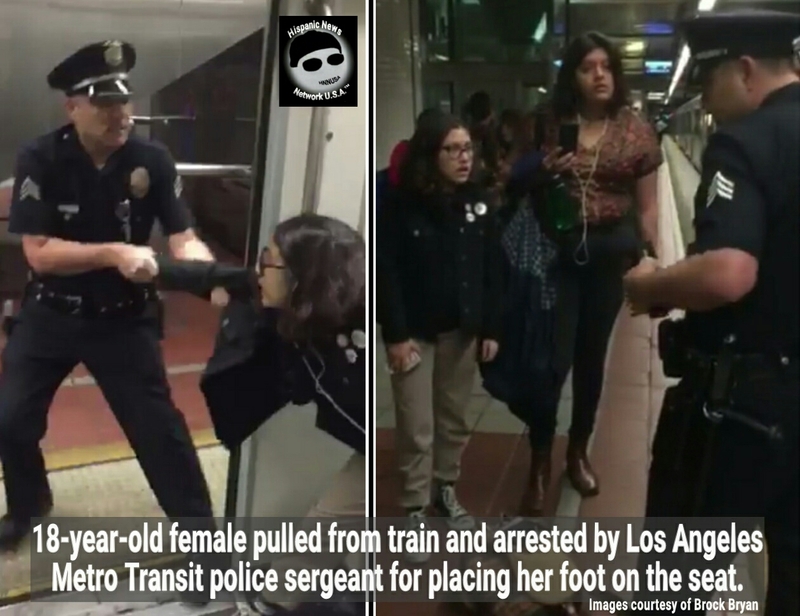 A passenger witness cellphone video recorded an 18-year-old female student being pulled from a train by a Los Angeles Metro Transit police sergeant for simply putting her foot on the seat, which is a violation of riding policy rules, according to the arresting police supervisor. Los Angeles, California – On Monday, Brock Bryan posted a cellphone video depicting a Los Angeles Metro Transit police sergeant (badge # 5203) pulling 18-year-old Bethany Neva from a train and arrested her for simply violating the transit policy rules, which prohibits passengers from placing their feet on the seat. The police sergeant than confronts an another female passenger who witnessed the incident. She challenged the sergeant’s alleged unlawful arrest of Bethany who was headed to the Department of Motor Vehicle (DMV) to get an ID because she had just turned 18 before being detained, according to the video footage. That woman who was a witness as well of the incident was also arrested by police. She called the cop “a f_cking scumbag” and no information is available, if she was also released. Steve Abee, who saw Bryan’s posted viral video on Facebook, gave him credit for releasing the video that actually helped Bethany get released without any charges. According to Abee who is Bethany’s teacher, she attends the Ramon Cortinas School of Visual and Performing Arts. Bethany just turned 18 and Bryan posted on his FB account that it has been confirmed by the Los Angeles Police Department that she was released without charges. 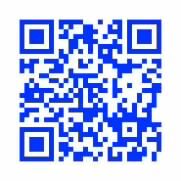 (Amended: 5/01/2017) by the Los Angeles County Metropolitan Transportation Authority, it is prohibited to place feet on seats under Code Section 6-05-100.J, page 22 and is considered a disorderly conduct violation, which results with just a warning and/or ejection for up to five occurrences with no fines or arrest. Update: Los Angeles Police Department (LAPD) on Monday launched a “use of force” investigation into the incident at the Westlake/McArthur Park station where Bethany Neva and a second woman were arrested. Neva was pulled from the train by a LAPD sergeant for placing her foot on a seat. Neva was released after arrest and cited for loud and boisterous conduct on the train and the other woman was charged for battery to a police officer for spitting at him, according to the LAPD. Also according Brock Bryan who video recorded the incident posted on his Facebook account that Neva had suffered minor injuries during the arrest. Comedian Steve Brown reported no injuries after an unidentified man gets on stage and attacks him while the audience looked on. Columbia, South Carolina – On Sunday, Comedian Steve Brown was attacked by an unidentified man while doing a show at the Comedy House at the 2700 block of Decker Blvd. in Columbia. Apparently a man under the influence was asked by Brown what was wrong during the show and he got mad. The man first struck a female companion and another woman who were trying to calm him down before he went up on stage and attacked Brown. Brown dodged multiple blows from the man who got a microphone stand and swung it at Brown several times and then he grabbed a stool and threw it at Brown. Brown says that he told the man, you are going to get tired and then I’m going to knock you out. Several men from the audience went up on stage and neutralized the incident. Brown later posted on Facebook that an unidentified crazy man was not being heckled, but that he had “just got up and lost his mind”. Brown reported no injuries, but complained about a lack of security at the Comedy House. Tumika LaSha posted a Facebook (FB) video that went viral when Brown was being attacked on stage by the man. Also, Sharad McNulty post on his FB, Brown’s response after the unfortunate attack. Brown was at the Comedy House doing weekend shows, which were packed to capacity. Police have not released any information about the Comedy House incident or if anyone was taken into custody.